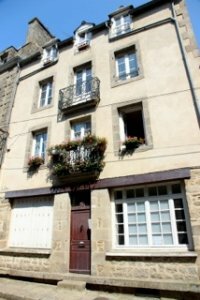 Description of Property: 1 Rue du Coignet. The interior is calm and comfortable. * Lounge - painted in olive press, with a superbly restored wooden floor, comfy sofa and two chairs. Its tall, beamed Gothic windows overlook the leafy Place de St Saveur. * Dining area - with large oak refectory-style table for entertaining friends or family. 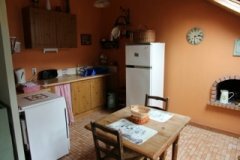 * Kitchen - with a warm, cosy feel with terracotta tiled floor, pine dresser and cupboards, butcher's block and antique breakfast table. The red and white check, rustic homely touches and feature fireplace make it charming. * 2 double bedrooms - with wooden floors with rugs and ceilings sloping towards the windows with unforgettable views over the gray/green slate rooftops of Dinan. The windows have pretty voile panels and attractive sheer canopies hanging over each double bed. Furnishings are simple but beautiful including a stylish French chair and antique pine carved mirror above the dressing table. But there is plenty of storage space with built-in wardrobes and an antique pine chest of drawers. * Modern bathroom - with a full-size bath and shower decorated with tiny multi-coloured mosaic tiles and brass light fittings. An old porthole serves as the frame for an unusual mirror. The house has central heating, a washing machine, TV, DVD and video player and selection of DVDs, videos and CD stereo. Outside Amenities: There is no outside area. However the apartment is one minutes from the beautiful Jardin d'Anglais behind the church where guests can relax. Surrounding Area: Outside, Dinan is a hive of activity. The weekly street market is held on Thursday morning, two minutes walk from the apartment in the Place de Champ Clos (which is also a big free car parking area every other day). The biggest medieval pageant in Europe, the Fetes des Remparts, takes place in Dinan every second year. Yet the apartment is still only 20 minutes from the glorious sandy beaches of St Cast, St Lunere and the quaint 19th century St Sulian is 12 miles north of Dinan which has been featured in many films. Follow the scent of freshly baked croissants round the corner in the morning for a leisurely breakfast in the apartment. Join the French in a café for cup of coffee, then stroll down the Rue de Jeruzal, taking in the many crafts and artisan shops en route, to lunch by the River Rance in the Old Port of Dinan. Relax on a lazy boat trip down stream for the afternoon. As the sun goes down sip a Kir Breton (locally-made cider and cassis) then sample the French fare in just one of the many tantalizing restaurants within walking distance of the apartment. Be charmed by this place and fall in love with France all over again. Mains water. Mains drainage. Electricity. WiFi Broadband Internet Access. Television. VCR. DVD. Hi-fi. Conventional oven. Microwave. Fridge. Freezer. Combined Fridge/Freezer. Washing Machine. Children welcome. No smokers. No pets allowed.